Today marks the First Friday in 2017's month of March. It's also the First Friday in the 2017 's Season of Lent. On Fridays during the Lenten Season, certain houses of worship offer services or masses where folks can participate in The Stations of The Cross. The picture posted above was taken at Corpus Christi Catholic Church, located in NYC. 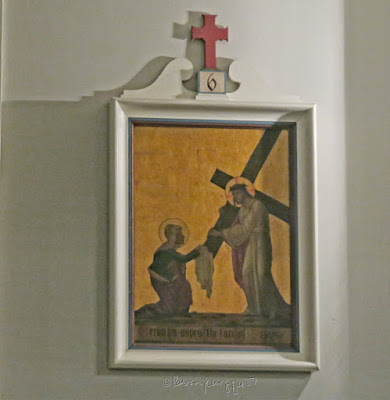 This image shows that particular house of worship's Sixth Station of the Cross, a station which seeks to remind us that Saint Veronica wiped the face of Jesus; and the implications of the necessity in helping others, no matter how large or small that gesture might be. And (as I've mentioned in a prior post here on Blogger) the meditation (associated) re Saint Veronica at the Sixth Station of the Cross, goes something like this, 'a faithful friend is a sturdy shelter; he who finds one, finds a treasure; a faithful friend is a life saving remedy...no sum can balance his worth...'"
The aforementioned contemplation that corresponds with the Sixth Station (where one always sees an image of Saint Veronica) is a good thing be reminded of, not only on this Friday of the Lenten Season, but always! For, indeed, faithful friends are beyond price.